It is no secret that the world of wine can be extremely daunting to many people. The skill set and expertise that goes along with being a wine professional (or even confidently conversing with one) is vast and intimidating. As a 22 year-old with a short few months of industry experience under my belt, I undoubtedly agree with this notion (my mom likes to to call me a ‘just-harvested grape bunch’). Yet I chose this industry because wine is magical and sophisticated and delicious and I believe it will keep me curious. As I embark on this challenging career-path (with the lovely CCA team at my side), the experiences to have and the content to study seem infinite and because of this, I am determined to sustain the magic and leisure I feel from the sound of a bottle opening or my first sip of a great rosé throughout my research. How it works: Subscribers are asked to answer 6 questions about their wine flavor preferences and the Winc team will curate wines that suit their palate and are delivered monthly. 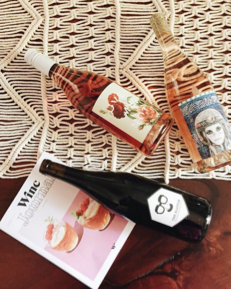 Winc is known for partnering with funky, lesser-known wine brands and many of them have beautiful labels that can be perfect for DIY home décor. What you get: 4 or 6 bottle monthly subscription tailored to fit your preferences on nose and flavor. How it works: Subscribers fill out a preference survey and VineBox will send glass-sized quantities from around the world based on the survey to doorsteps. This is especially great for a consumer looking to have a taste of new wines before purchasing a whole bottle. What you get: 3-6 hand selected wines by the glass each month packaged in sleek tubular packaging. How it works: This is a box that delivers a wine and food pairing to subscribers’ door each month. This one’s great for pairing-and-cheese fans, but not so great if you’re looking for multiple bottles in a box. What you get: 1 bottle of wine, charcuterie and cheese and tasting notes. How it works: Ninety + Cellars allows subscribers to choose between their red, mixed/rose? or white wine clubs and only partners with 90+ scored wines. The service includes free shipping, tasting notes, and discount coupons during weekly promotions. This is great for consumers who particularly care about scores. How it works: subscribers choose 6 bottles every 6 weeks or 12 bottles every 8 weeks and choose between all red, all white or a mixed pack box. What you get: 6-12 bottles hand-picked by Martha Stewart delivered quarterly. The box includes exclusive serving, pairing, and entertaining suggestions written by Martha and if subscribers don’t love the wine, the wine club will replace it for free.